Dec. 21, 2017 -- More and more people are flying with pets they call necessary for emotional support. Sharon Giovinazzo goes so far as to call them something else: four-legged terrorists. That may seem harsh. But Giovinazzo, who is visually impaired and travels at least once a week in her job as president and CEO of World Services for the Blind, says she was recently walking through an airport with her service dog Watson when a small dog came running out of a gate waiting area and lunged at them, biting Watson under the chin. Luckily, the bite wasn’t serious. But Giovinazzo says she was horrified and rattled. “The owner said ‘but this is my service dog.’ And I said ‘No, no, no. That’s your dog that you don’t want to put in a kennel and you went out and bought the equipment you need off Amazon, and you’re getting away with it. Giovinazzo suspects there was a big difference between Watson -- bred and trained to be a service dog that performs a task for someone with a disability -- and the dog that attacked him. Airlines report more and more people are taking pets on planes by calling them emotional support animals. Such animals don’t have to perform any tasks or services for their owners. Instead, a licensed therapist writes a letter certifying that the person traveling with the animal has a mental illness -- like PTSD or anxiety -- that the animal soothes by its presence. In 2015, one major airline carried more than 24,000 emotional support animals, compared with about 14,000 service animals, according to the International Air Travel Association. Thanks to a federal law, emotional support animals are allowed to board a flight at no extra charge. They can sit on the floor at their owner’s feet, or in their laps, if they are small enough. Not everyone is happy about that. Statistics kept by the U.S. Department of Transportation show that complaints related to animals for people with “unspecified” disabilities have surged by 500% in the last 5 years -- increasing from 411 in 2012 to 2,041 in 2016. In contrast, complaints related to service animals for people with visual impairments have remained relatively steady, about 13 each year for U.S. airlines. Sometimes the incidents are annoyances -- an emotional support pig was kicked off a U.S. Airways flight in 2014 after it defecated in the aisle, for instance. In other cases, emotional support animals have injured people. In February, a dog nipped a young girl who was boarding a Southwest Airlines flight in Phoenix, breaking the skin on her forehead and causing a minor injury. In November, Brittany Langlois of Southbridge, MA, said she was bitten in the leg by an emotional support dog at Orlando International Airport while she waited to check in for her JetBlue flight to Boston. In June, Marlin Jackson of Daphne, AL, was bitten in the face by an emotional support dog as he boarded a Delta flight from Atlanta to San Diego. Jackson was taken to the hospital. He needed 28 stitches. On Twitter, a frequent flier who is allergic to dogs has started logging these incidents under the hashtag #esaoftheday. He’s gathered stories of emotional support pigs, horses, ducks, and turkeys. He recently snapped an image of a passenger in Miami International Airport with three animals -- two cats and a dog. A woman who recently tried to travel with an emotional support peacock also recently made headlines. United Airlines didn't allow the bird to fly. “It is a concern,” says Perry Flint, Head of corporate communications, North America, for the International Air Transport Association, a trade group for the world’s airlines. Cheryl had a note from her doctor -- a general practitioner -- saying she needs Ali with her. She also had an official-looking certificate from the United States Service Dog Registry. The registration was free, but the certificate Cheryl got in the mail cost $55. In the fine print on the website, the company is careful to say that registration is voluntary and that no certificates are needed to have a service animal. “A big red light should go off the minute someone says their service dog is registered,” Zemaitis says. “There are also websites that promise a doctor’s note with no need to actually see the doctor. The whole thing is so very disconcerting and horribly dishonest on all sides,” she says. A federal law -- the Air Carrier Access Act -- requires airlines to accept emotional support animals with a note from a doctor or licensed therapist. The letters aren’t difficult to get. A cottage industry has sprung up online of companies that offer them for $50 to $200. They may also throw in an official-looking vest, leash, or certificate that identifies the pet as a service animal. Another law, the Americans with Disabilities Act, protects people from having to produce any documents if they say they have a service dog. The laws don’t require proof because they were meant were to protect people with disabilities who need service animals from harassment when they take their animals into public spaces. But more and more travelers are abusing what is basically an honor system so they can fly with pets. Jessica Payne, 23, recently flew from Phoenix to Atlanta with her 4-year-old dog Daisy. Payne says Daisy started out as a pet, but now comforts her when she’s stressed. “I have anxiety,” Payne says. Payne took her first flight on a plane about a year and half ago. She says it was nerve wracking. “I was crying my eyes out the first time. I can have anxiety about anything -- heights, being out of control … she comes and comforts me,” Payne says. She says most of the time, Daisy flies without any problem. But this trip, Payne says the people seated around her were hesitant. Payne says she got a letter from a therapist she’s in touch with regularly that states she needs Daisy for anxiety. She knows that some people lie to get those letters so they can travel with their pets for free. She agrees that the system can be easily abused. “If the animal isn’t servicing you, they shouldn’t be with you,” she says. Certapet.com is one of the Internet companies providing letters to people who want to travel with animals for emotional support. For $149, the company will evaluate you for a travel or housing letter. For $199, it'll send both to people who qualify. The company promises the letters within 48 hours of screening. If a person doesn’t qualify for an emotional support letter, Certapet says, it will refund everything but a $25 fee. The process involves a questionnaire, a second screening questionnaire, then a chat with a therapist, says Haley Neidich, a licensed professional social worker who is the company’s director of clinical development. Neidich says she turns down people every day who want letters, but she wasn’t immediately able to give numbers on what percentage of people are turned away. “I find a lot of people who maybe are just trying to come through to get their animal because they think it will be convenient are pretty deterred by the fact that they need to speak with a therapist and answer really specific questions about their medical history,” she says. She says there’s nothing to stop people from lying about their mental state. And it’s not possible for the company to evaluate an animal’s fitness or training. The company tries to educate its customers about the important differences between an emotional support animal and a service animal. Airlines and members of the disability community began conversations with the Department of Transportation in 2016 to tighten the rules that pertain to service and emotional support animals. “Airlines and most of the disability community agreed that changes were needed to the system, because of the abuse by travelers who purchase emotional support animal (ESA) certifications online,” Flint says. He said it also makes it harder for people who need to bring on their service animals because airlines can only accommodate so many requests per flight. But the parties involved failed to reach an agreement, stalling any crackdown. Flint say he hopes the Trump administration will issue new rules that prevent abuse of the system. Some airlines have decided not to wait on tougher federal regulations. Delta and United Airlines now have additional requirements forpeople who want to travel with emotional support animals. Passengers who want to bring an animal on board for comfort must submit documents proving that their companions are trained, necessary for their well-being, and fully vaccinated 48 hours before their flights. 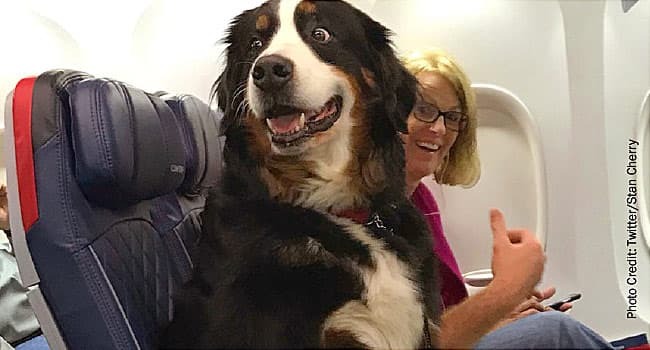 In some cases, the airlines say that people flying with service animals may also be required to show a veterinary health form to prove their helpers are up to date on their shots. States are also trying to crack down. As of July 2017, 21 states had passed laws against the use of fake service dogs. These laws make it a crime to dress a pet as a service dog when it doesn't have any special training or to lie to a therapist about a health need for a service animal, according to the Animal Legal & Historical Center at Michigan State University. These laws are tough to enforce, however, says David Favre, a professor at Michigan State and an expert on animal law. He says he doesn’t know of anyone who’s been prosecuted for violating these laws, though clearly it happens all the time. “It’s a mess,” Favre says. It’s also becoming a risk for therapists who vouch for these animals. Zemaitis says she recently spoke to a psychologist in Massachusetts who was asked by his patient to sign a letter so she could bring her pet on an airplane as an emotional support dog. “That dog bit someone. That person sued the doctor who signed the letter,” Zemaitis says. Zemaitis says she understands why people try to bring their pets aboard as emotional support animals. But she says it’s critical that airlines do something because legitimate service dog teams like Sharon Giovinazzo and Watson are being impacted. “It happens every time we travel, and it’s getting worse and worse,” says Giovinazzo. She says emotional support dogs routinely lunge and bark at Watson as they travel through airports, in addition to his recent bite. “They’re just little terrorists is what they are. How a terrorist functions is by scaring you,” she says. It can cost $40,000 to get a dog as highly trained as Watson. His training involved about 18 months of intensive education. Watson not only steers Giovinazzo around obstacles and keeps her from walking into dangerous situations, he’s conditioned to be almost invisible in public spaces. He doesn’t react to loud noises or to other animals. Giovinazzo has even taught him some special skills that come in handy for frequent fliers. He can steer her to the nearest ladies’ room, for example. He knows the smell of Starbucks. He can even take her to an electrical outlet if she needs to charge her phone. Asked if she’s ever considered cutting back her travel to protect her dog, she says she can’t. Her job requires her to show companies that blind people are as capable as those who aren’t visually impaired. Watson helps her do that. “My dog is a solid dog. He can stand next to a bomb that goes off, and he wouldn’t flinch. But other service dogs, other guide dogs that people use, something like that might rattle them, and they would have to retire. Then you’d have to apply for another one,” she says. In her mind, there need to be tougher requirements for traveling with pets. “The problem is that nothing is happening to the people who are breaking the law. For anything else, crime equals punishment. That isn’t happening here,” she says. Sharon Giovinazzo, president and CEO, World Services for the Blind, Little Rock, AR. Perry Flint, Head of corporate communications, North America, International Air Transport Association, Washington D.C.
David Favre, JD, professor of property and animal law, Michigan State University, East Lansing, MI. Cathy Zemaitis, director of development, National Education for Assistance Dog Services, Princeton, NJ. ADA.gov: Americans with Disabilities Act. Jessica Payne, 23, airline passenger. Haley Neidich, director of clinical development, Certapet.com.